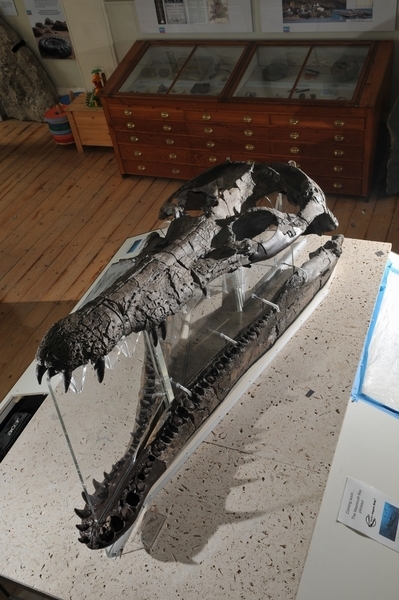 The Lottery Heritage Fund has purchased an enormous pliosaur skull from the Kimmeridge Clay of the Dorset coast. 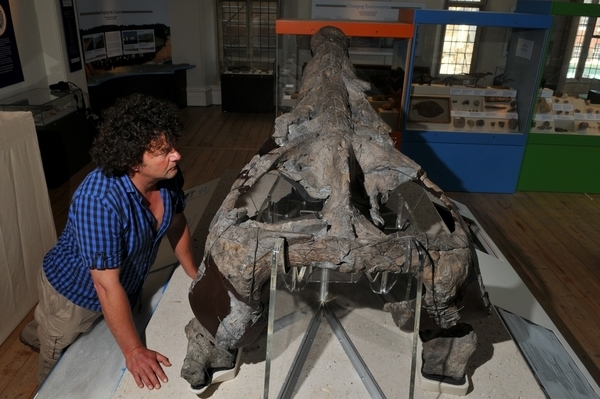 On 8th July 2011 the pliosaur hits the media again! 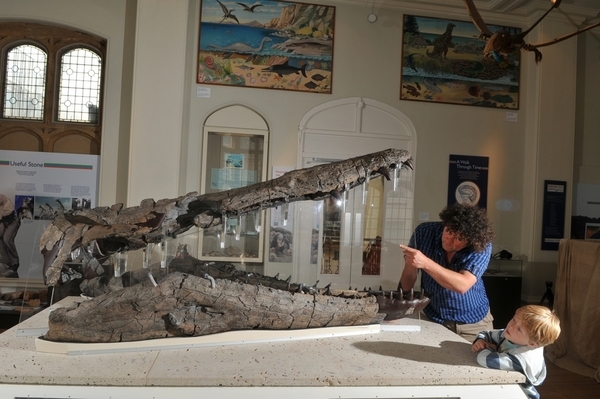 The new Pliosaur display in the Jurassic Coast Gallery of Dorchester County Museum will be formally opened, with David Attenborough as special guest. 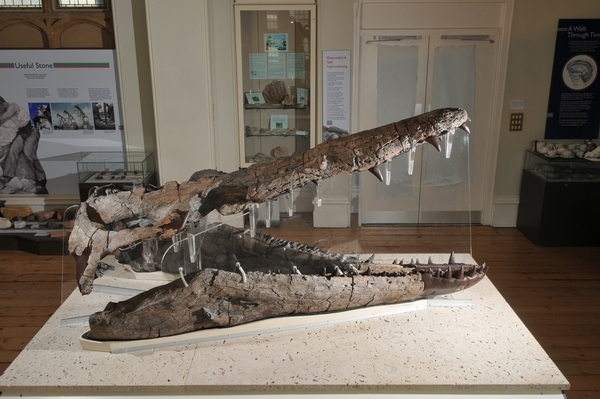 The purchase of the skull of an enormous pliosaur from the Kimmeridge Clay of Weymouth Bay by the Lottery Heritage Fund was formally announced on 27th October 2009. The purchase came after a long and complicated series of negotiations, and now forms a major new display in the Dorset County Museum in Dorchester. This is an impressive specimen. It is huge - the length of the skull from the tip of the snout to the back of the parietal ridge is 2.1 meters. Scaling from the lateral reconstruction of Pliosaurus by Taylor and Cruickshank (1993) this gives an overall lenght of about 2.4 m. By any standards, this is an enormous animal. I have had not had the chance to study the specimen in it's prepared state. Judging from photographs, it still looks most likely that this is of the genus Pliosaurus. The overall proportions of the skull look about right, the teeth are trihedral in section, flat and smooth on one side and heavily ridged on the two others sides. The lower jaw symphysis is unfortunately missing, but matching the jaw to the skull suggests that it was fairly elongate. The specimen appears to be significantly more robust than either of the Westbury specimens of Pliosaurus brachyspondylus (Taylor & Cruickshank 1993, Grange et. al. 1996). As both are crushed this may be an artifact of preservation although the depth of the lower jaw in particular suggests that this is a real difference, possibly due to the larger size and ontogentically older age of the new specimen. The palatines appear to be much more robust than those of Pliosaurus brachyspondylus. This may also be an ontogentic or preservational difference. A number of scientific studies of the specimen are already being carried out, or are being planned. When found, the skull was encrusted with oyster shells and other bottom-feeding invertebrates, forming a thick layer in some parts. Students of David Martill at the University of Portsmout are investigating this epifauna to unravel one chapter in the story, what happened to the huge carcase of the animal as it lay on the sea floor. The University of Southampton put the skull through a CAT scanner to reveal the internal structure on the bones. This was widely reported by the media (here's one of many reports). The scans will be used to build a computer model of the skull at Bristol University which will allow robust estimates to be made for the biting power of the animal - and find out if it was powerful enough to bite a car in half! The post-cranial anatomy of large pliosaurs in general and Pliosaurus in particular is not known reliably, so any estimates of the overall length of the animal need to be treated with some caution. Tarlo (1959) reconstructed the large Callovian pliosaur Liopleurodon with an overall length seven times that of the skull. This would give an overall length of 16.8 m. However, specimens of geologically rather younger pliosaurs preserved in articulation (Acosta et. al. 1979) suggest that the overall length was closer to five times the skull length, giving an overall length of 12m. Until we have a better knowledge of pliosaur post-cranial anatomy, any estimates of length are rather speculative. Estimating the weight of such an animal is even more problematic and depends on many assumptions. Even with a full skeletal reconstruction, soft-tissue reconstruction is largely a matter of assumptions. A very rough estimate can be made by measuring the displacement of pliosaur models and assuming a density slighly higher than that of water. This gives a weight of between 7 and 15 tons.